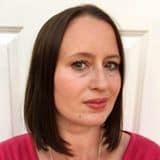 Summer is the time for quick and easy light meals, whether for lunch or supper, and to make the most of summer produce it is good to use seasonal vegetables which are at their peak. I picked these broad beans at the local pick your own fruit and vegetable farm. Stored in a cold garage, they have lasted over a week since picking and now needed to be used in a recipe. 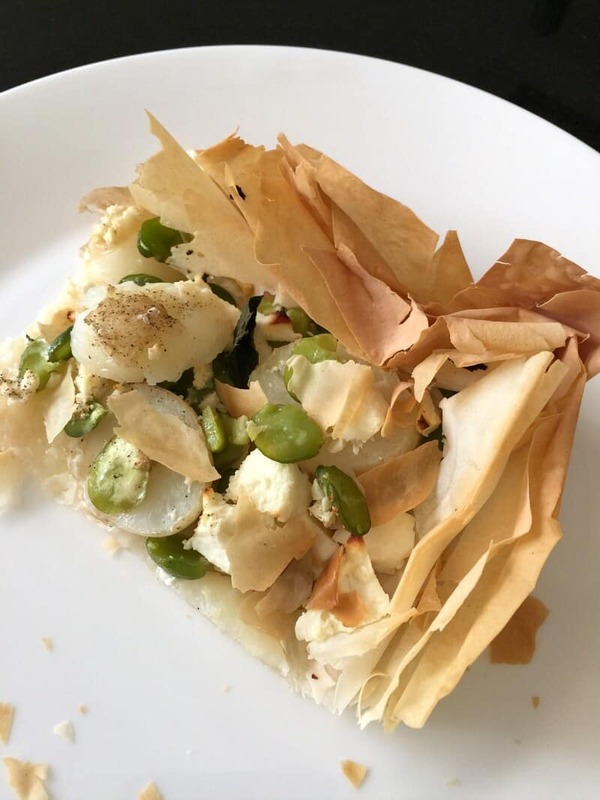 My broad bean, feta and new potato filo tart is delicious for a light meal and so quick and easy to make. A free form tart is quite tricky so I made this filo tart in a roasting tray, using the edges of the tray to create the edges of the tart. Slip a few strips of parchment in the base of the tray before you start layering the filo pastry sheets so that you can use them to lift the tart out of the tray after baking. 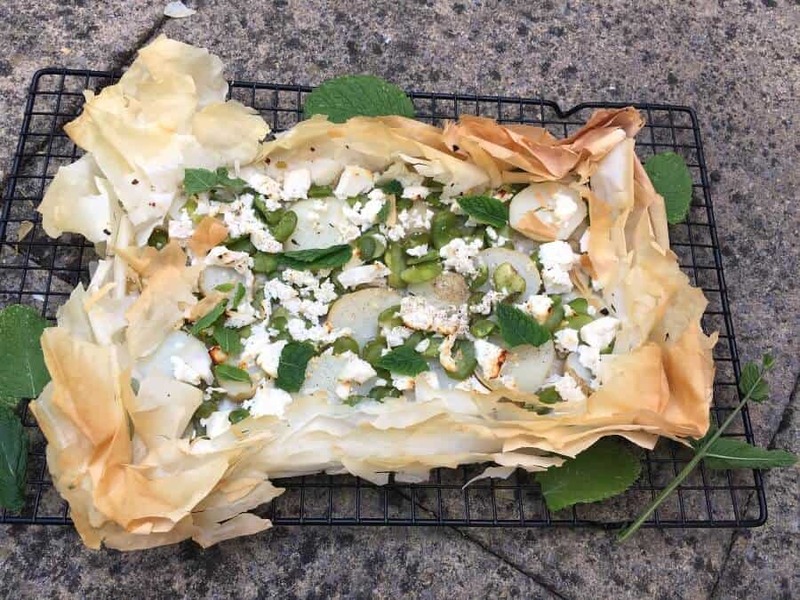 Freshly picked broad beans, new potatoes (dug from the vegetable patch and left over from dinner the previous day), some feta (I used light feta style cheese to reduce the calories), and a few filo pastry sheets are all you need to put together this broad bean, feta and new potato filo tart. Add some freshly picked mint leaves if you have it growing in your garden to serve. Feta and broad beans are both enhanced by the addition of mint. 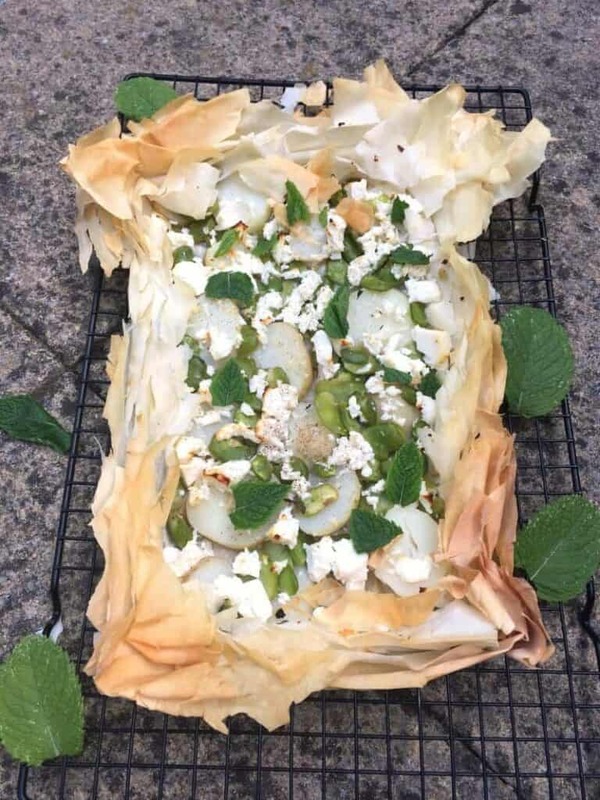 The saltiness of the feta goes so well with the creamy broad beans and the crunch of pastry. If you have more broad beans left over you might also want to try my broad bean, pea and mint hummus too. I like to serve this tart with a green salad for lunch, since it is quite light you can serve half the tart per person if you like, as we do. Or, if you are more restrained and have a lighter appetite, a quarter of the tart might be enough for you, especially if served with more than just a green salad, perhaps add in a couscous or rice salad. I love butternut squash and giant couscous salad. Deliciously crispy on the outside and full of summery flavours, it is a great recipe to make for picnics too. I’d make it the same day so it doesn’t go soft in the fridge. You can also reheat it for 15 minutes in a low oven if you want to serve it warm the next day. Cook the broad beans in a large pan of boiling water for approx 5 minutes. Then drain, pour into cold water and remove the skins. Set aside to cool. Preheat your over to 180 degrees C.
Take your roasting tray (I used a deep one) and spread 1 tsp of olive oil on the base. Fold a few strips of parchment paper across the base of the tin so you can get the tart out after baking more easily. Unfold the first sheet of filo pastry and place in the tray. Pour 1 tsp of olive onto the pastry and spread it over carefully. Then place the next sheet on top and again pour on the oil and spread it out. Do this with each of the four sheets, finishing with oil. Scrunch the edges of the pastry to make an edge. Put the sliced new potatoes on the base of the tart on top of the filo pastry sheets. Crumble over the feta cheese and then pour on the cooked broad beans. Season with pepper and drizzle over the last teaspoon of olive oil. Put the tray in the oven and bake for approx. 25 minutes until golden. Garnish with the mint leaves and serve with your favourite salads. OOh yum! 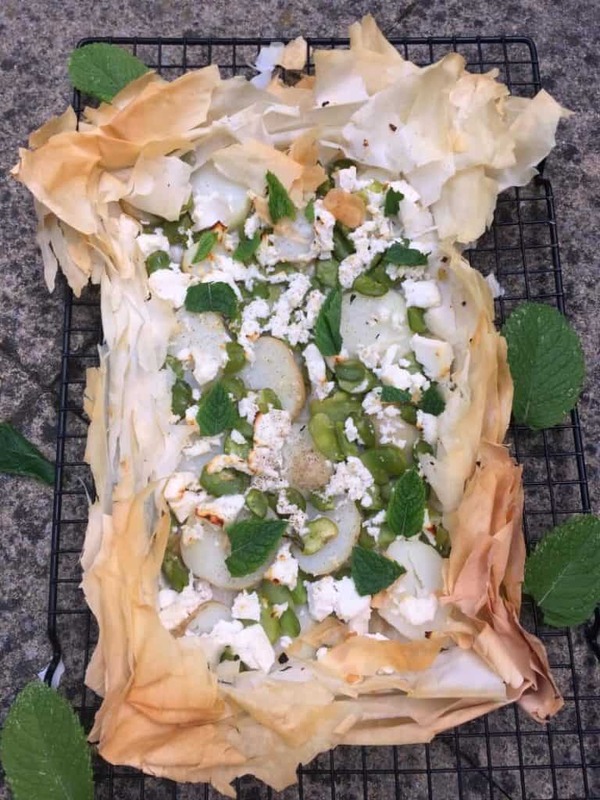 Feta and broad beans – what a wonderful combination! You are very welcome Karen. I wish broad beans were around for longer! This looks amazing. 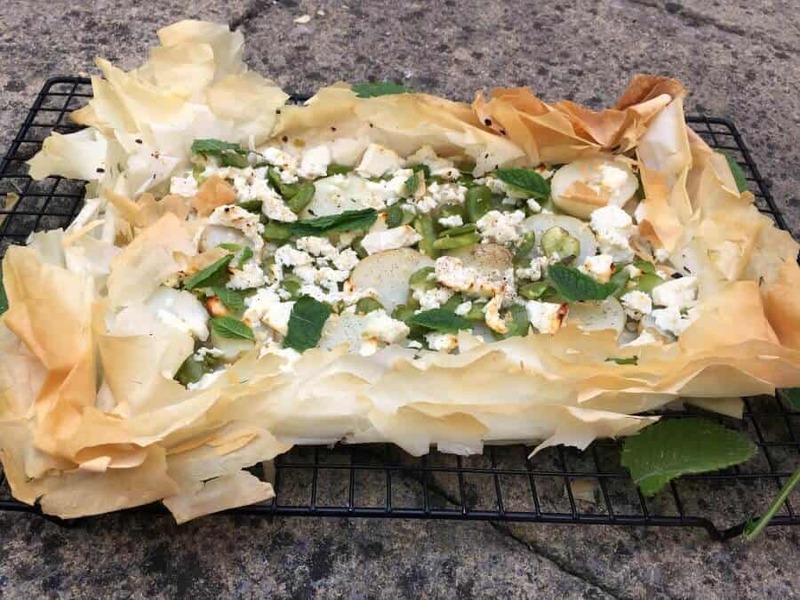 I love a filo tart and obviously anything with feta on it, yum! I definitely don’t have enough tart (the good kind) in my life. Added to todo list because things gotta change around here. Lovely flavour combo! This looks delish! I love broad beans. Our local pick your own has tonnes atm. Will definitely be making this. love a good pick your own! Ooh, that looks super yummy Lucy. I love this time of year for all the wonderful summery veg. 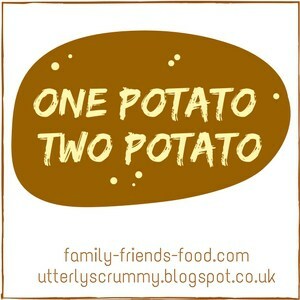 Especially homegrown veg – mmmmm! Homegrown has to be the best doesn’t it! Oh Lucy, that looks so dreamy! I totally want to reach over and snap off a (not so) little piece of that filo!! !